NOTE: Entire pattern is worked holding one strand of each color together while you work. R2: Ch1, turn. Sc in ea sc. All subsequent rows: Repeat R2 until desired length. 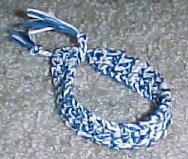 braided portion on each end to tie the bracelet on your wrist.